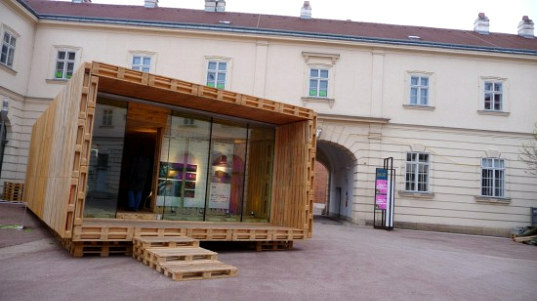 Efficient & Affordable Wood House Made From Shipping Pallets! When we saw this beautiful house made almost entirely from wood pallets, "Awesome" was the first word that came to mind. The <a href="http://www.palettenhaus.com/" target="_blank">Paletten Haus</a> was designed by two students from the University of Vienna and won the <a href="http://www.competition.gaudi-programme.eu/" target="_blank">2008 GAUDI European Student Competition </a> on Sustainable Architecture. It's made out of <a href="https://www.inhabitat.com/2010/03/09/reader-tip-birdhouses-upcycled-from-discarded-shipping-pallets/" target="_blank">reused pallets</a>, and is modular, energy efficient and affordable, making it perfect for low-income housing. 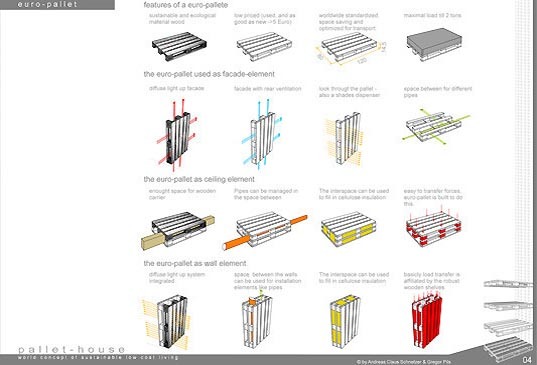 It could even offer a housing option for people in developing countries with little access to building materials -- in fact, the designers of the Paletten Haus are in South Africa right now developing a low-cost unit that runs $11/ sq foot. 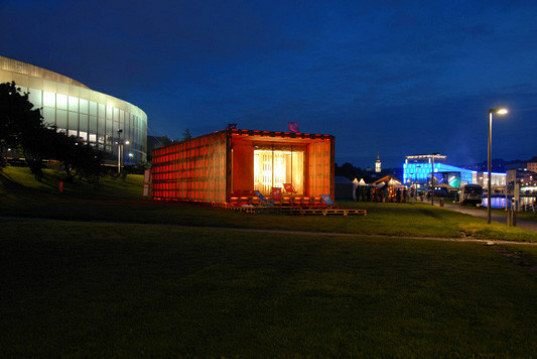 The 60 sq meter Pallet Haus is constructed from 800 recycled pallets. 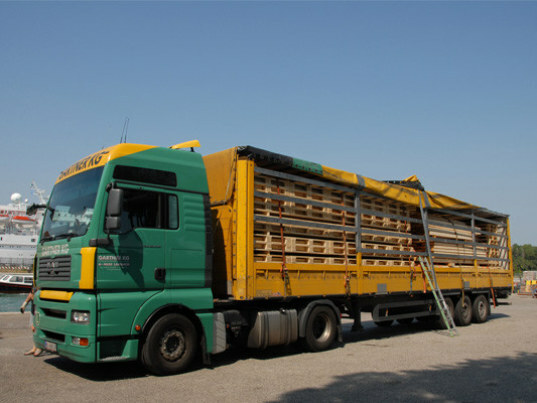 The pallets can easily be transported via truck and then the house can be easily dismantled and moved if necessary. 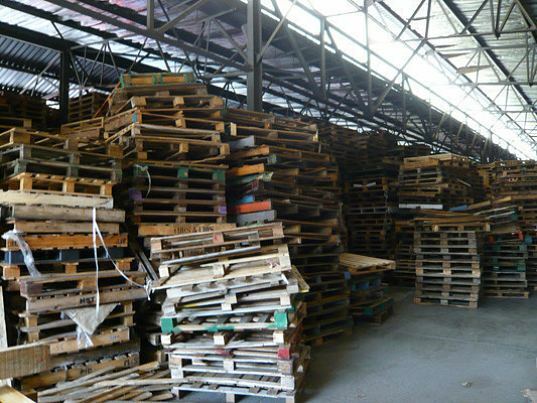 Pallets are found all over the world, are durable, recyclable if necessary and come in a standard size. 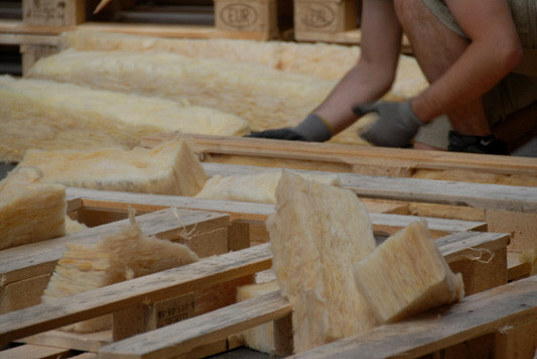 Insulation can be woven into the pallets or sandwiched between two layers. 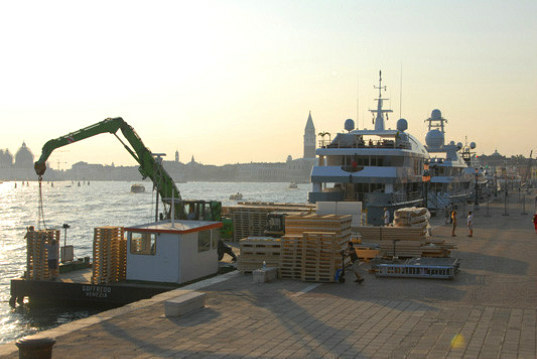 For the 2008 Venice Architecture Biennial the materials were shipped in by water. 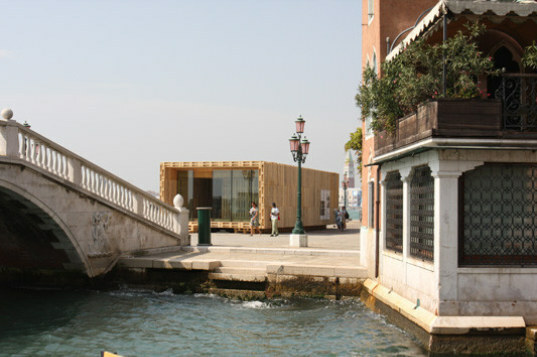 Construction of the Pallet Haus in Venice, which was easily accomplished by only a few people. 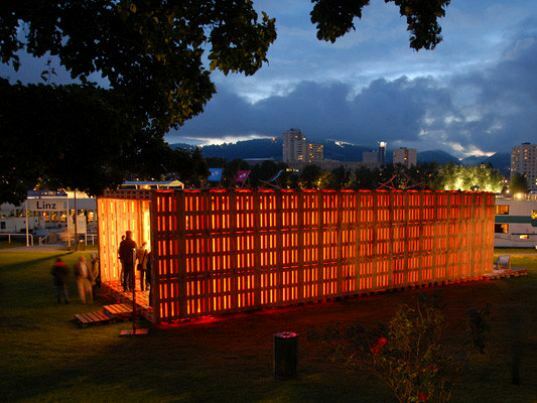 The pallets serve as the walls, ceiling, floors as well as a sunscreen. This pallet house built next to traditional Venetian architecture was 60 sq meters in size and cost approximately 80,000 euros. 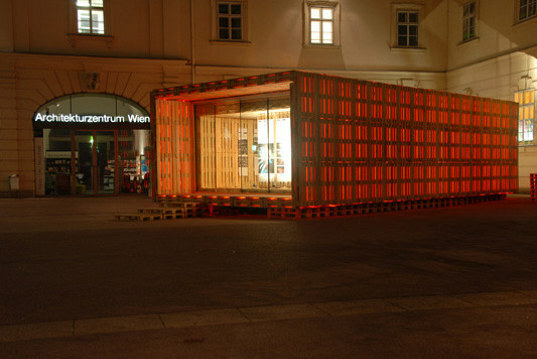 Here the Pallet-Haus sits before the Architecture Center in Vienna. The Pallet-Haus also is designed to be very energy efficient with a low energy demand and collects rainwater on the roof for the toilets. Since pallets come in a standard size, a home like this can be built anywhere. 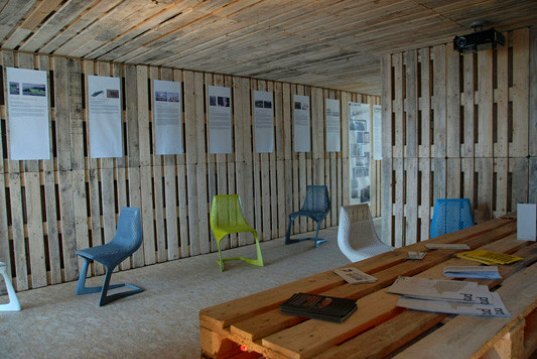 The Pallet-House is energy efficient, sustainable, modular and affordable. 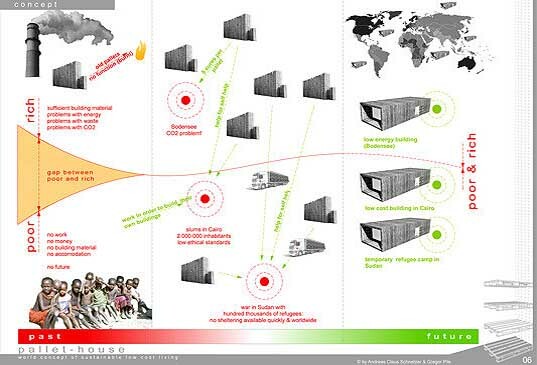 The Pallet-Haus was originally designed to meet the needs for housing in developing nations who do not have access to affordable building materials. Currently, the designers are in South Africa working on an affordable prototype. When we saw this beautiful house made almost entirely from wood pallets, "Awesome" was the first word that came to mind. The Paletten Haus was designed by two students from the University of Vienna and won the 2008 GAUDI European Student Competition on Sustainable Architecture. 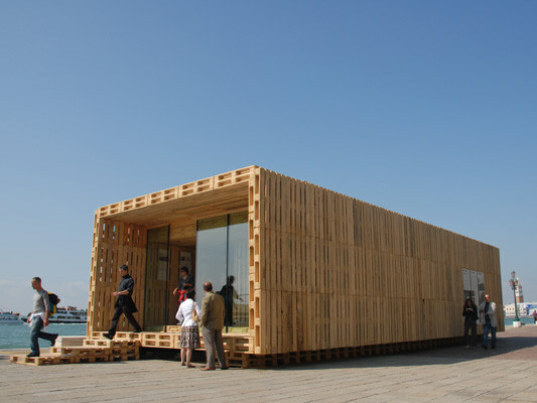 It's made out of reused pallets, and is modular, energy efficient and affordable, making it perfect for low-income housing. It could even offer a housing option for people in developing countries with little access to building materials -- in fact, the designers of the Paletten Haus are in South Africa right now developing a low-cost unit that runs $11/ sq foot.